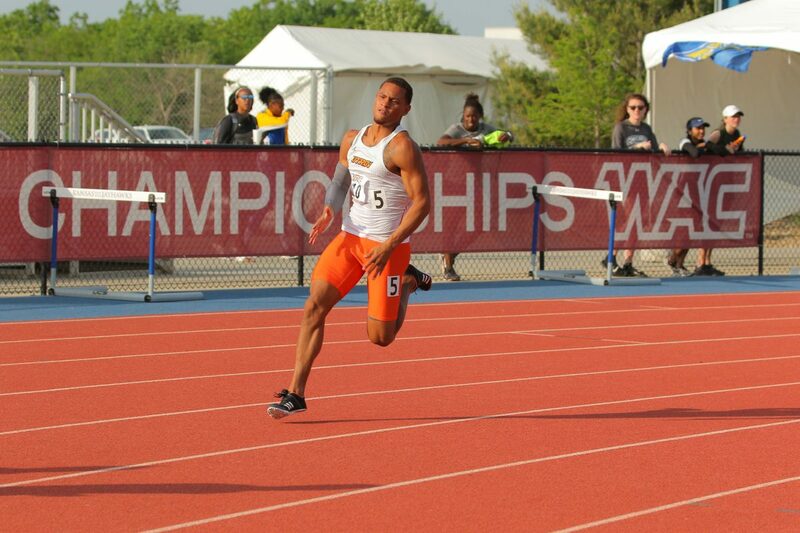 UTRGV's Yariel Matute competes in the 2018 WAC Outdoor Track and Field Championships on May 12 in Lawrence, Kansas. 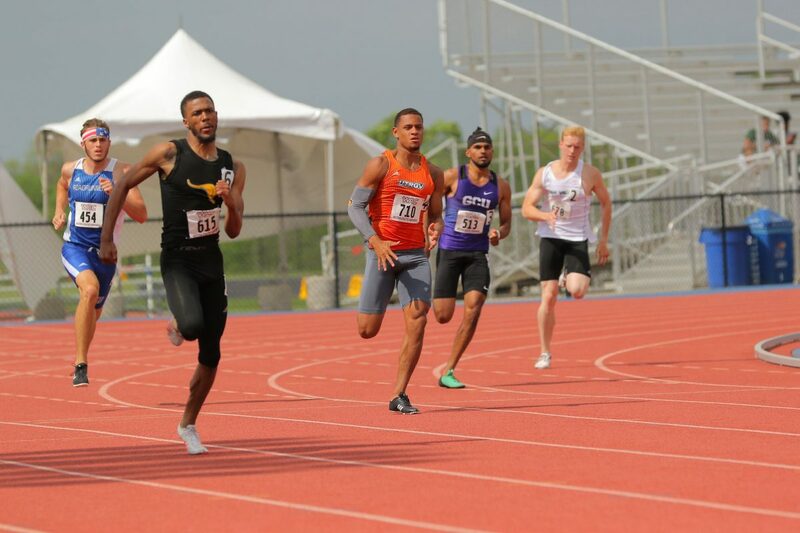 EDINBURG — UTRGV speedster Yariel Matute had a breakout season in 2018, setting personal and school records in the 200- and 400-meter dashes and shining as part of two relay teams. The junior La Joya Juarez-Lincoln grad came home from the WAC Track and Field Championships last month with three silver medals and a tracksuit full of pride. Those accomplishments piqued the interest of Honduran national track and field officials. Matute, whose parents are Honduran, said he is close to completing the paperwork necessary to compete for the Central American country. He would be the program’s fastest 400 runner and have a shot at the Olympics. That’s a far cry from when he moved to Juarez-Lincoln High School from Orlando, Florida, as a junior in 2013 after his mother married a Valley native. Not only had he never run track, Matute said he had never played a team sport. The 6-foot, 180-pounder said many of the Juarez-Lincoln coaches wanted him on their teams. He ended up playing basketball with some success, then transitioned to the jumps in track. He adjusted well and soon was a leader in the track program. His fluency in Spanish helped. Matute started practicing running events because he said he was “bored” after doing the jumps. So he was inserted into the 1,600 relay, ran a 52-second split and quickly became a varsity regular. In 2015, Matute began to run the 400. He soon became the best in the Valley. Competing at the collegiate Division I level also means a more serious training regimen that includes regular ice baths, lifting, eating better and taking trainers’ advice seriously. He’s matured and improved his technique. Matute has been banged up along the way, and he acknowledged that the 2018 season was the first year he felt completely healthy — mentally and physically. The hard work and attention to detail has paid off. This year, he set a personal record in the 200 with a blazing 21.05 mark. That time is second-fastest in program history (Ken Williams ran a 21.04 in 1973). Matute’s 47.06 in the 400 is his personal best and the second-best all-time for UTRGV (Jameson Strachan ran a 46.60 in 2011). All marks referenced are outdoor. Matute and his teammates Ronnie Ollivierre, Alex Lara and Anthony Magallon set a new outdoor program record in the 400 relay with a mark of 41.12 seconds. Matute and his 1,600 relay team also posted the program’s fourth-fastest time ever with a 3:13.19 mark at the WAC meet. The criminal justice major will return for his senior year and has his eyes on adding even more accomplishments to his already impressive resume.